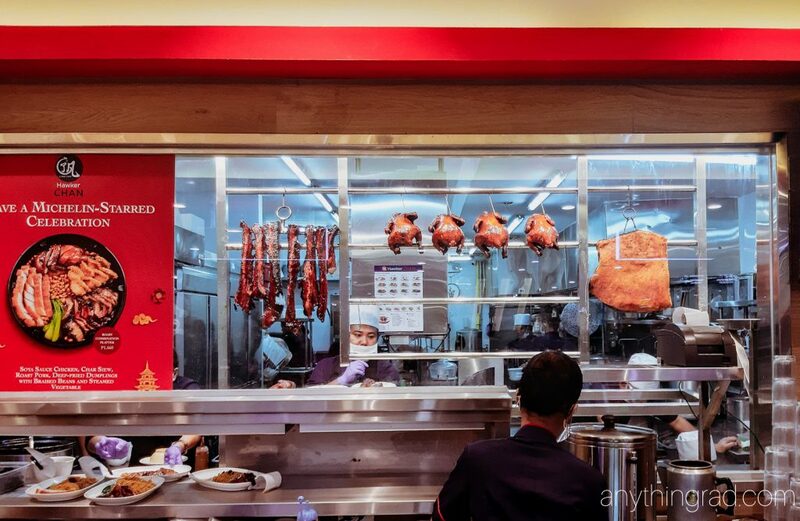 We finally got the chance to eat at Hawker Chan SM North EDSA that has been recognized as the world’s cheapest restaurant to be awarded One Michelin Star! It’s a Singapore-based restaurant that serves what they call the “affordable luxury” and in this post, I share to you why it’s a MUST to get your next dining experience here! Looking around the area, the slogan caught my attention as it stated a street name: 335 Smith Street. Apparently, that street is pinned to a Chinatown Complex Food Center in Singapore which I would infer to be where all Hawker Chan’s history started. 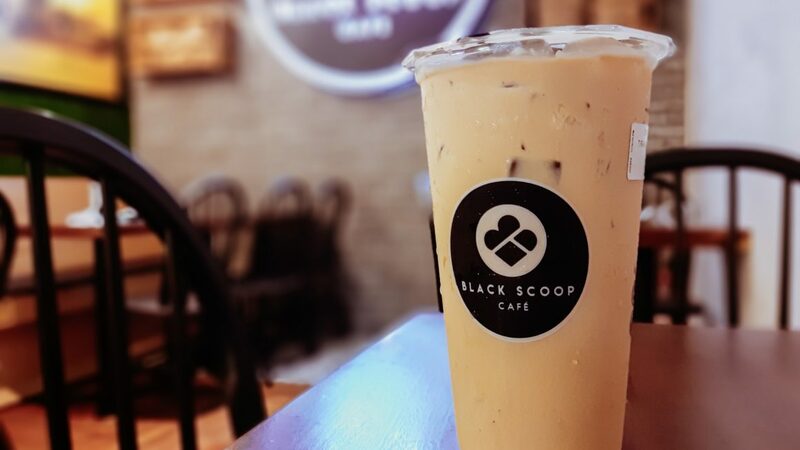 Thanks to Foodee Global Concepts, we can now enjoy and have this dining experience as well. Disclaimer: This is not a sponsored post. All opinions were formed from my love of great food! 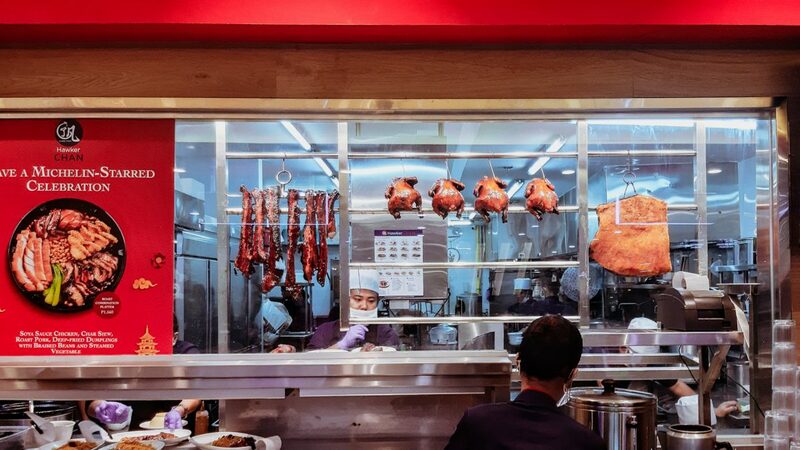 The concept of the place seemed to be copied from the whole “dining experience” brought about by the original Hawker Chan at Smith Street. On site, you will see a station for Orders, a station for Pick-up, and a Self-Service station where you can get your condiments (which by the way are so good! ), utensils, and drinks. At the order station, you can get a piece of their menu board while waiting for your turn. 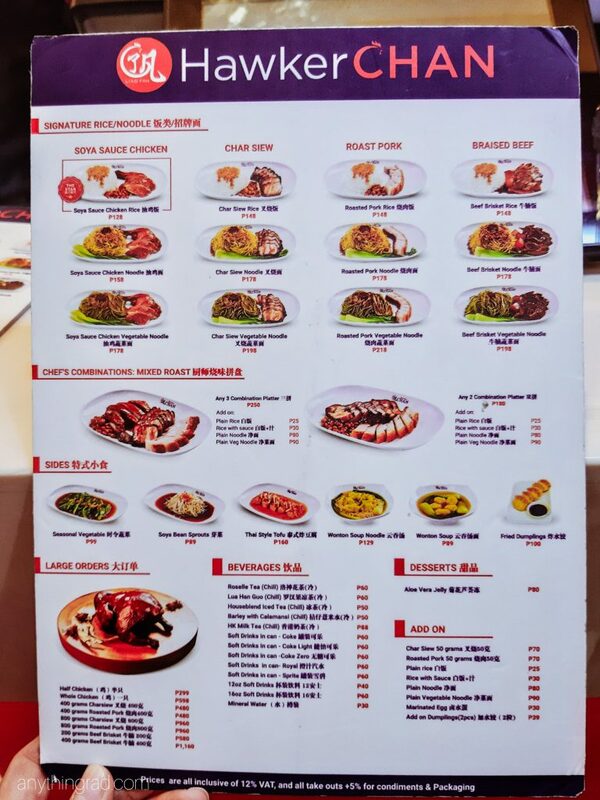 They basically serve 4 types of meat: Soya sauce chicken, Roast pork, Braised, Beef and the one that is new to me: Char Siew, which is classified as a Cantonese style of roasting meat. You can either have your meal paired with rice or noodles, whatever floats your boat. 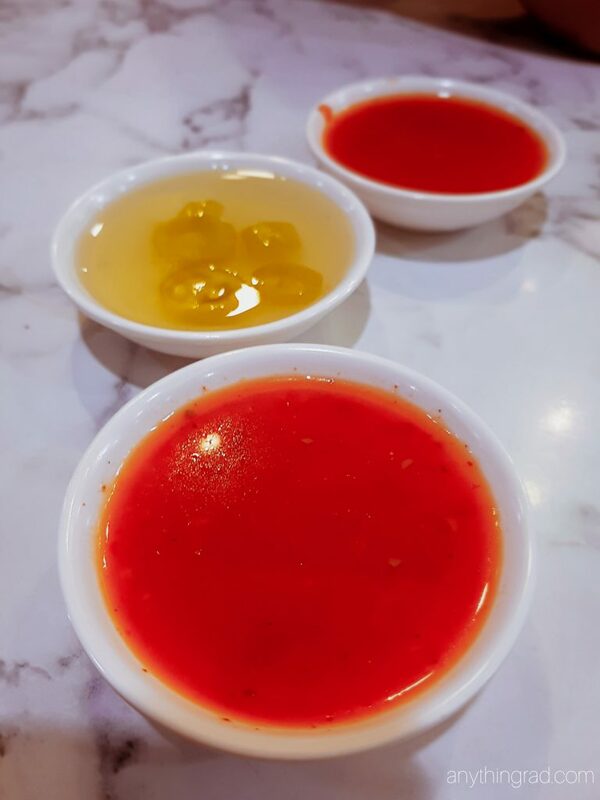 They also serve side dishes like soya bean sprouts, vegetables, tofu, wonton soup, and, our highly recommended fried dumplings — definitely a must-try! Also, you can get yourself some large orders or Chef’s Combination of meats and add-ons that you might like. 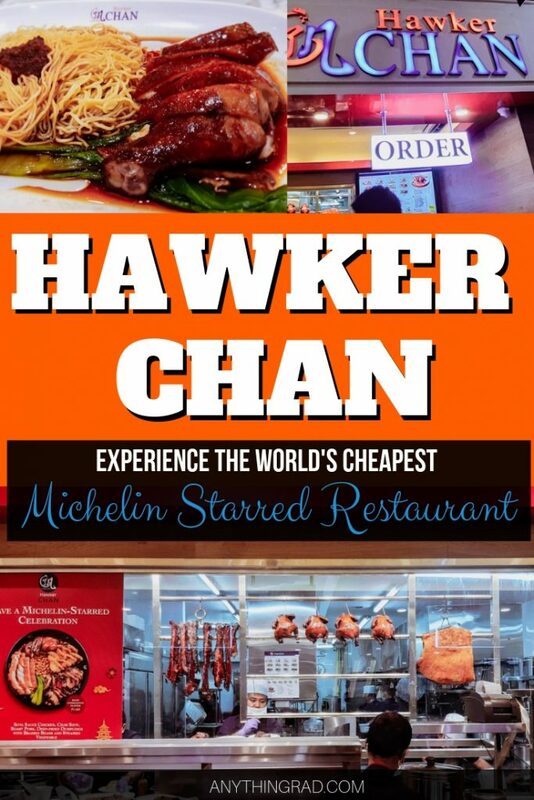 What I initially love about Hawker Chan is its affordability. You can get yourself a single decent meal at a cost of less than PHP 200.00 with all the savory goodness already! I got the chance to eat twice in here and we are vouching these as our Michelin-starred Hawker Chan favorites! I like having the soya sauce chicken with noodles more than than having it paired with rice, but I guess it depends on your preference. The flavorful taste of the noodles got me as compared to the typical taste of rice. 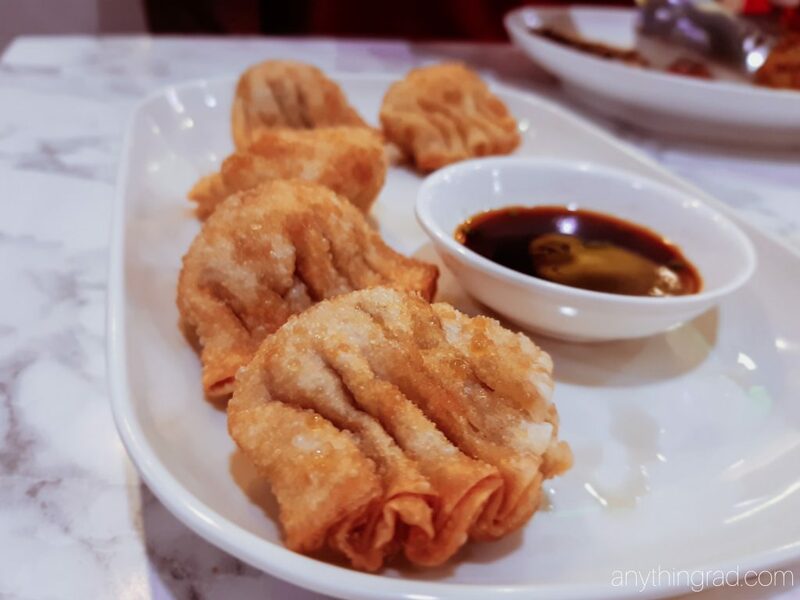 We always order the fried dumplings because they do complement with the rice/noodle meals. Plus, the crispy outer and savory inner parts of the dumplings are heavenly good! The sauce is very much a match together with the dumplings, and for the price of PHP 100, I’m sure that they can satisfy your tastebuds. The Char Siew goes well with the orange sauce! Apparently, I don’t know the names of the sauce. 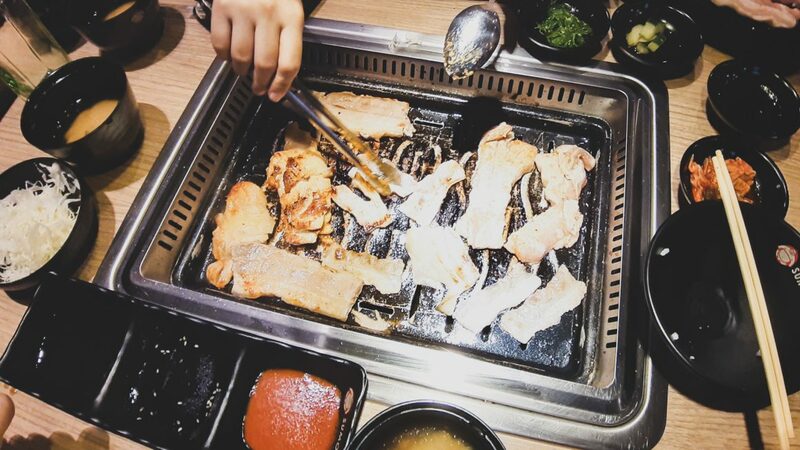 However, the clear one goes well with chicken, while the orange sauce goes well with pork upon tasting, haha. 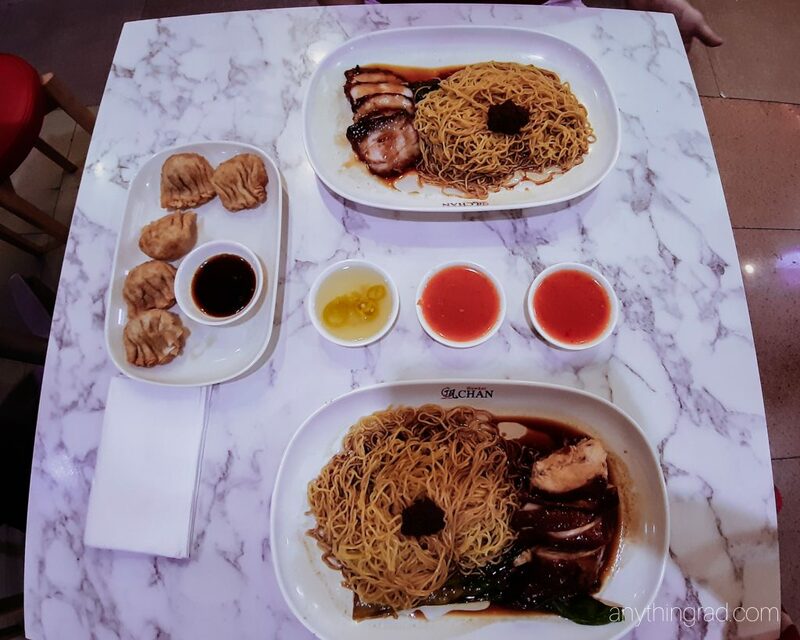 Our go-to menu: Char Siew Noodle (top), Soya Sauce Chicken Noodle (bottom), Fried Dumplings (left) and their clear and orange sauces from the Condiments Area. As you can see, this is our go-to order whenever we eat. We get two meals and a side of fried dumplings. The fried dumplings is a must-have in our table! 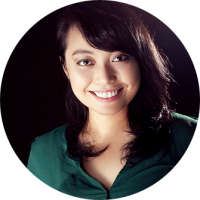 All-in for a cost of less than PHP 500! Not bad for a date, right? Haha. 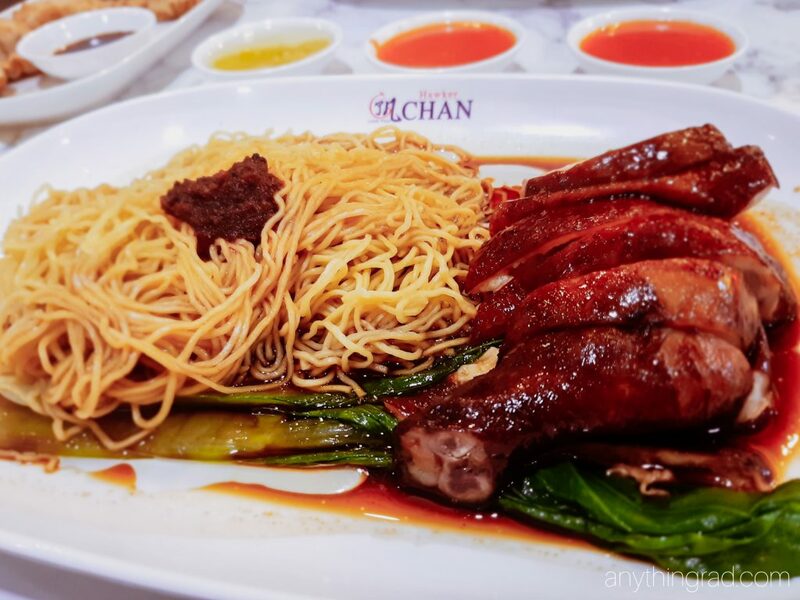 Hawker Chan is perfect for fulfilling your Asian food cravings! Where to eat some Hawker goodness? 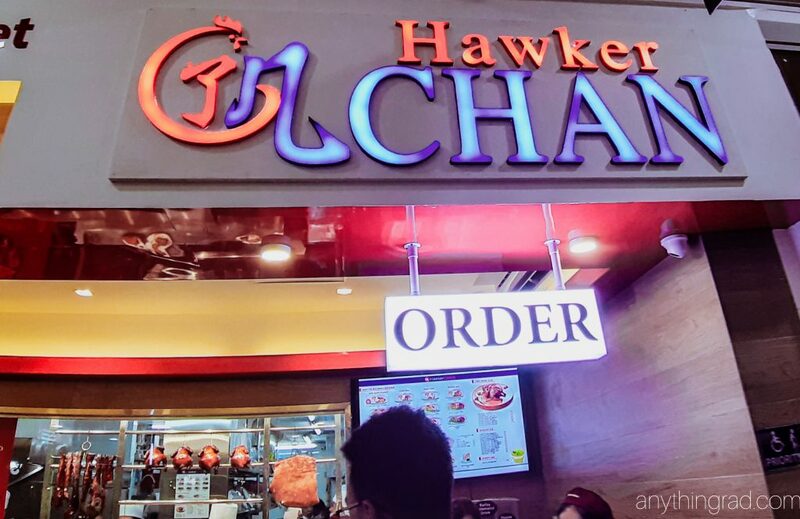 What’s your Hawker Chan favorite? Comment down below! This is so cool! Who would’ve thought a Michelin Star restaurant could be so affordable. oh wow this looks so yummy. I love al the sauces they offer! 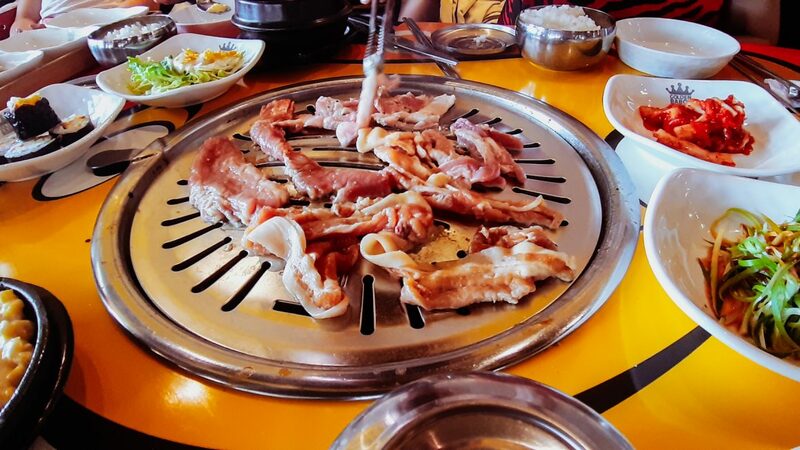 I miss eating this in SG. hope to visit hem once soon. I love that this place has meatless options. The food looks so delicious. It all looks so yummy! I wish I had a good place like this to eat near me! I am a sucker for pocket-friendly luxury! I’ve yet to have the pleasure of eating here but it’s on my bucket list now! The title of the restaurant itself is attractive enough to catch the customers. I like dumplings pic. Gonna keep this restaurant in mind, would prefer to visit it. The friend dumplings look amazing.I can taste those chicken noodles from here. I wish we had resturants like this where Inlive. This place looks delicious and must be if it’s a michelin star reward. 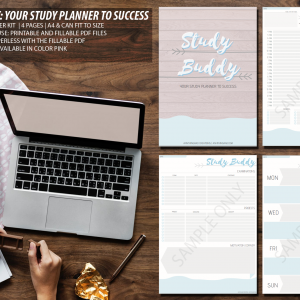 I love the fact that it is affordable and accessable. A cheap Michelin star yessss any time. The food looks so delicious. Thanks a lot for sharing. Everything at this little gem looks so amazing. I had no idea Michelin awarded stars to cheap eats. This is my kinda place, and looks really reasonable. I’d love to find out a bit more about it, and I think that a trip to Singapore seems to be the best way to try it! It all looks so very amazing there. I would love to try it out. The fried dumplings look pretty darn delicious. Mmmm!!! I would love to go to this place! And they have meatless options! I love it! Oh, yumm, everything looks so delicious! I would love to be able to go check it out very soon! Oh wow! These dishes look so delicious, and so unfancy too! Love!